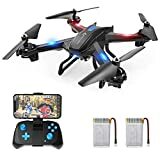 Best hexacopter drones for sale reviews 2019 – find out which hexacopter drones are best to buy. MJX, DJI and other popular hexacopter drone brands are reviewed. Quadcopters are often regarded as synonymous to drones. And that’s not much of a surprise considering the fact that quadcopters make up for the large majority of popular consumer drones. That said, what about other multirotor drones such as a hexacopter or an octocopter? The latter, with as many as eight rotors, falls almost exclusively in the category of industrial drones. However, hexacopter drones tread the middle ground, so to speak. You can get easy to fly, entry/intermediate level and relatively inexpensive hexacopter models that are just somewhat more proficient machines compared to their four-legged counterparts. 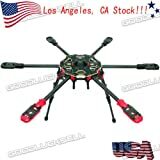 On the other end of the spectrum, there are industrial grade, fully professional hexacopters, normally used for high quality, pro shooting purposes and you’ll need to shell out on the upwards of $1,000 for these latter models. In the present best hexacopters list, we have picked models primarily from the first category since we don’t suppose that hobbyists would be quite prepared to spend $1,500 on a drone model. However, for readers who would really like to get their hands on one of these high-end models, the last model on this list would be worth trying! This is an entry level hexacopter highly suitable for first time flyers. The unit packs a lot of features especially for a model available for under $50! As it is with hexacopters with their six motors, they provide greater stability compared to quadcopters and this is true for this model as well. You’ll get a flight time of about 7-9 minutes and flight distance of up to 100 meters. The 6 axes gyro system and the 4-channel function technologies help provide stable flight and strong wind resistance. 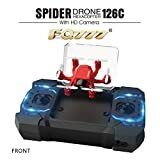 The copter, however, does not come with a built-in camera, although you have the option to buy a separate camera attachment. 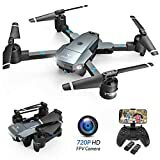 According to users, the copter works fine with the camera attached though you won’t get HD images with camera (something you won’t even expect from a drone of this price range). Other useful features include Headless Mode, One-Key Return and live streaming and 3D split-screen display via an FPV app. Our Verdict: Nicely built and a pretty dependable machine, great value for money. If you’re a fan of minidrones, you’ll love this nano hexacopter. 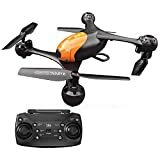 The reason we include it in our list is that this drone is remarkably well-built and within its limited range of aerial acrobatics, it is pretty good at holding up its own. So, even with hard landings or usual in-air collisions and bumps, the unit won’t get damaged or dented too easily. Which also makes it ideal for kids. Sometimes, one may want to gift his little son a drone but don’t feel too confident whether the little one would be able to handle it or not. With this pretty sturdy and well-built mini hexacopter, you don’t need to worry about it at all. The unit also comes fitted with a 2 MP camera, so you’re good if you want to take some photos and videos as well. Flight duration is up to 7 minutes and the flight distance about 50 meters. At $45, the unit is also highly affordable. – Limited maneuverability; no flips and dives, etc. So, not for those who want to practice those stunts with an affordably priced drone. Our Verdict: Great for the lovers of on-your-palm, mini multicopters. Ideal for kids. This and the next model on our list are what are called in the drone world terminology, ARFs or Almost-Ready-to-Fly drones. This means that the drones don’t come in a ready to fly (RTF) mode and you’ll need to do a good bit of assembly job on your end to get it on the go. So, as you can already figure out, these models are not meant for beginners. 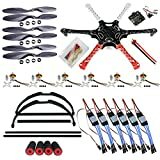 But, there are a lot of drone enthusiasts out there who love this ‘part-DIY’ models that they can, to a degree, customize according to their requirements. The Tarot680 Pro, despite its name, is not quite a professional machine. But this 6-axis foldable frame copter is loaded with numbers of sophisticated technologies (such as automatic landing gear retraction, safety locking devices, wire protection slot and brushless ESC installation) and also boasts of high quality 3k carbon construction. You’ll never get a machine of this quality if you’re opting for RTFs from an identical price range (the Traot680 assembly package is priced at around $100). Although, we must also mention that the $100 price tag is a bit of a misnomer since you’ll have to invest separately for a remote controller, a 5-channel transmission system and some other required accessories. But even with all those added costs, you still get a superior quality machine. For the same quality in a RTF unit, you may have to pay almost double the final cost. Which is why we add this one to our list. – Not for amateur flyers; requires some research and/or foreknowledge of drone assembly. Our Verdict: Great value for money plus real fun experience for anybody willing to try their hand on ARFs, drone assembly. If you are a kit-building enthusiast, you’ll enjoy this QWin Out drone building kit even more. The F550 hexamotor airframe is the heart of the unit but all the other parts (motor mounts, blades, propellers right down to the little screws and nuts) are included in the package separately and you may need to devote a good deal of time to assemble the machine. But the assembly also gives you great flexibility in terms of how you want to customize your hexacopter. There are a number of little details which we cannot go into right now. But if you’ve some experience with assembling drones (or machine parts, in general), rest assured that you’ll love this hexapod drone kit. Keep in mind, though, that as with our earlier model, you’ll have to buy a lot of gear and ancillaries separately (including battery, charger and transmitter). – Not adequate information for assembly on the instruction manual; however, this is not a major issue, thanks to the online support community. Our Verdict: Great affordable alternative to Ready-to-Fly models. Now, to come to the big guys! And when it comes to professional copters, things can seldom get bigger than DJI models. And as for a hexacopter, one of the most trusted and valued model today is the DJI S900. Of carbon fiber lightweight construction, this drone is designed to support professional, high-power cameras and many professional cinematographers use this or other DJI industrial models to get their aerial footages. Fitted with a load of highly sophisticated and DJI-patented technology that accommodate smooth flying operation and shooting, you simply can’t go wrong with this one. The unit comes with a 5.5lbs thrust power and can support a maximum payload of 18lbs. And it will still fly uninterrupted for 20 minutes with payload maxed out. It is compatible with a number of high quality gimbals, including Zenmuse Z15, BMPCC, GH3 and GH4. The bundle version with the A2 flight controller will cost you around $2,000 whereas the S900airframe alone is priced at $1,200. However, if you choose for a Z15 gimbal as part of the bundle, this will set you back by about $3,200. – It is difficult to find fault with this unit, as long as the price is not an objection! Our Verdict: One of the best (if not the best) professional hexacopter drone you can invest in. A hexacopter drone is a UAV (Unmanned Aerial Vehicle) gadget that can fly in the air without a human pilot abroad. The machine is controlled by a ground based controller. So, first of all it’s a drone and a multirotor one. However, in contrast to the most popular multirotor drones, namely quadcopters, a hexacopter drone comes with six motors and corresponding propeller blades. Basically, having six instead of four motors gives the hexacopters more power, height, speed, stability and endurance. Hexacopters are popular with drone hobbyists, but they are primarily seen as industrial grade drones and their most common use is for professional grade, high quality aerial shooting. Proper tips and guide for selecting a hexacopter drone model will depend exclusively on what purpose the drone is bought for. If you are a drone hobbyist and wants a somewhat powerful machine than a quadcopter, then you should look for pretty much the same things (namely, control range, flight time, design & construction, charging time, height & speed, maneuverability, camera type, parts replacement options as well as other convenient features such as headless mode, altitude hold, one key return, live feed features, FPV and so on) as you would if you were buying a consumer grade quadcopter. The payload: More often than not, you would be mounting professional filming cameras on the copter and since these cameras come heavy, you must check the payload of the machine. Weight: Weight and dimensions are important factors, too. We’ve already mentioned the payload issue. However, there is a bind here. Although weightier machines function better when it comes to factors such as wind resistance, a too heavy machine can compromise the maneuverability of the drone. For this reason, you should ideally look for a unit which is not too heavy itself, but is able to carry a heavier payload. The DJI copter on our list with its light but sturdy carbon fiber airframe is a perfect choice on this regard. Yuneec Typhoon H UHD is another hexacopter which comes with a lighter frame but is able to handle heavier payloads. Safety features: Since you are mounting an expensive camera unit on the copter, you want to make sure that the camera will be safe in case of any mishap. So, you must check on the safety features and the list of intelligent technologies provided by any particular unit. Apart from the above, battery life, height and speed, maneuverability (gimbal and air controller compatibility), live feed with streaming options and an LCD display are some of the features you should ideally look for in a professional grade hexacopter. For non-professional units, you’ll get good quality hexacopters from all reliable drone manufacturer brands. However, when it comes to industrial hexacopters, we would especially recommend units from DJI and Yuneec. Both brands offer some great professional hexacopter models at reasonably affordable prices. For professional grade machines, be prepared to shell out anything in the vicinity of $1,150 for the central frame/unit alone. For additional technologies, you will need to pay extra. For example, the Yuneec Typhoon H Pro (one of the less expensive models in this category) hexacopter costs $784. However, if you want the machine to be equipped with the latest version of Intel RealSense Technology, the price goes up t0 $1,899. Just as in DJI S900: if you want the A2 Flight controller installed, the price is $2,000 compared to $1,200 for the airframe alone. Basically, hexacopters come with pretty much the same benefits and features of a quadcopter and this is true for both professional as well as lighter, amateur units. But since hexacopters are fitted with six rather than four motors, they obviously pack more power. So, expect to get more height and speed from a hexacopter. You get higher elevation and higher speed from hexacopters when compared to quadcopters of a roughly similar price range. Also, the extra motors provide greater safety and stability to a hexacopter drone. The six motors are fitted 120 degrees apart and even if a motor dies during flight, the other motors will compensate and you won’t experience a crash or a heavy tilt. Sometimes, a hexacopter can remain stable even with two motors out. However, this will depend on the relative positioning of the burned out motors.